The Arromanches 360° cinema is a popular introduction to touring the D-Day landing beaches. The belvedere gives excellent free views of the Mulberries. The Arromanches 360° Cinéma Circulaire is a circular cinema showing archive footage from the D-Day landings and the Battle of Normandy that followed. It is not a museum and visitors will learn little new or any specific facts other than reading a few panels while waiting for the movie to start. 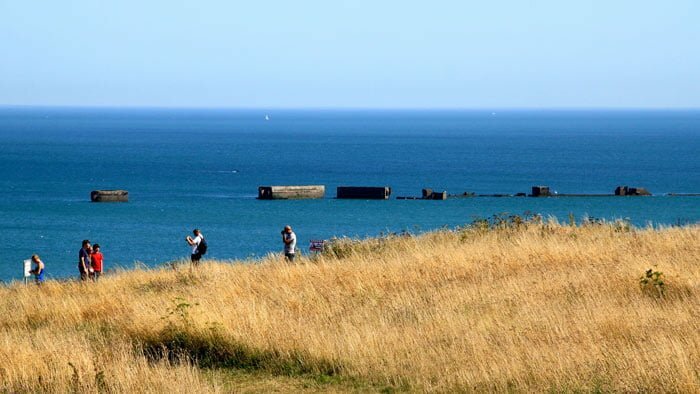 Even if not visiting the cinema, visit the site to appreciate the view of the remaining mulberries that formed Port Winston that supplied the Allies with material during Operation Overlord and the Battle for Normandy. Arromanches 360° is a circular cinema showing films on nine large screens with visitors standing in the center of the room with sound seemingly coming from all directions. The movie includes amazing archive footage of D-Day, the Battle of Normandy and the full Operation Overlord. The cinema does not explain any events – the sounds are either from fighting or music, or most eerily the mostly silence and heavy breathing of soldiers waiting to land at D-Day beaches. The movie can be quite emotionally draining once realizing that these are real archive material of war and soldiers probably going to die shortly after and not a Hollywood movie. That said, the movie does not actually show any dying and very little on the horrors of war. Arromanches 360° is not a museum and should not be treated as such. Visitors will learn very little new, if at all, from the movie. No explanations are given and it is assumed that visitors should at least be versed on the basics of D-Day before seeing the movie.A few panels and video material can be studied while waiting for the show to start. It is a good experience to see this half-hour movie as part of a tour of other D-Day landing sites. However, if the budget is limited, many will find better value at any of the large number of D-Day related museums in Normandy. Admission is €5.50 for adults, €5 for children 10 to 18, and free for under 10 year olds. 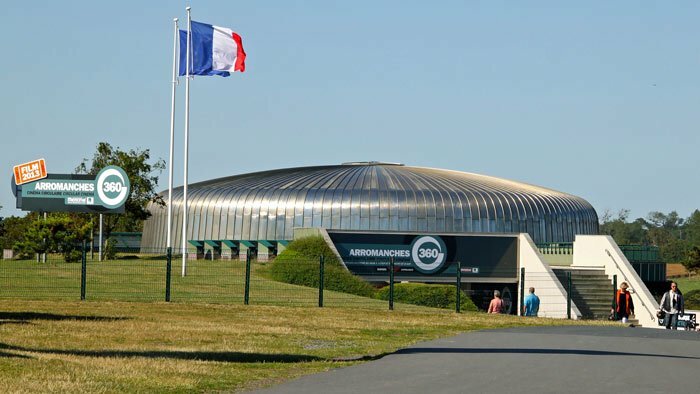 Combination tickets are available with the Mémorial de Caen museum. Opening hours jump around quite a bit but is generally around 10 am to 6 pm – a bit longer in summer and closed most of January. 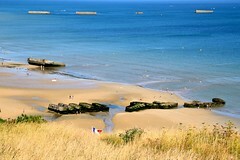 See Arromanches 360 for details. Arromanches 360° sits high on the cliffs next to a belvedere overlooking the Atlantic Ocean and the remains of the mulberries that formed Port Winston in 1944. Immediately after the D-Day landings, the Allies started to construct a prefabricated harbor off Arromanches-les-Bains. It consisted of boats towed across the English Channel and sunk or fixed to form a temporary harbor. 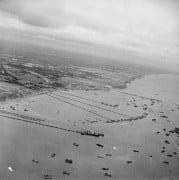 This temporary harbor, named Port Winston after the British Prime Minister Winston Churchill, allowed 9,000 t of material to be unloaded per day (equal to La Havre’s prewar capacity). 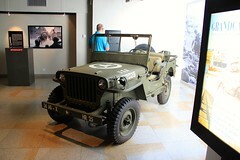 During the 100 days that the harbor operated in 1944, half a million vehicles and 2.5 million men have landed here. The remains of the mulberries, especially the breakwaters, can still clearly be seen at low tide. Some of the finest views are from the panorama viewing point at Arromanches 360°. 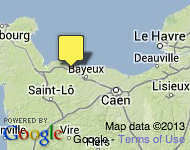 Arromanches 360° and belvedere can easily be reached by car. From Arromanches, follow the D514 towards Asnelles. Ample parking (small charge) is available. 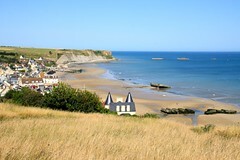 Alternatively, it is a pleasant but steep uphill walk from the town center and beaches of Arromanches. In summer, a free tourist train also provides transportation from the D-Day Landing Museum (Musée du Débarquement) in Arromanches to the top of the hill and the belvedere. The mulberries can also be seen from the German battery at Longues-sur-Mer.